Monrovia, Liberia - The Commander-In-Chief of the Armed Forces of Liberia (AFL), H.E. 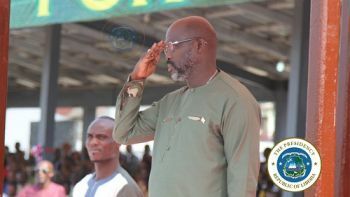 President George Manneh Weah, has reassured men and women in arms of his government’s commitment to strengthening and equipping them to adequately and efficiently perform their constitutional duties to the state. The President who paid homage to the Armed Forces of Liberia said his government would not fall short of its responsibility until the army is brought to the standard of excellence. Delivering a special statement Monday, February 11, 2019 at programs marking the 62nd Anniversary of the AFL held at the Barclay Training Center (BTC), the President said he was personally gratified and proud of the services men and women in arms have been rendering the state and people of Lberia. “One of the hallmarks of any civilized nation is the way it supports and respects those who fight in defense of their Country, including their families,” Commander In Chief asserted, referring to the army as an integral part of the nation and an inspiration to all Liberians. He reiterated Government’s commitment to upholding the welfare of the men and women who continue to put their lives on the line to keep the nation safe. He classified those in uniforms as unsung heroes who must be given keen attention, stressing that when families are stressed and distressed, it impacts negatively on the overall readiness of our soldiers. “So, my administration will strive to create a secure environment and wellness programs for our military families, and provide them with a quality of life that is commensurate with the value of their support for our men and women in arms,” he said further. To achieve this goal, C-I-C Weah said he instructed AFL Chief of Staff to immediately prescribe the appropriate policy, procedure and management of all welfare- related issues including the present welfare account. At the same time, the President has expressed displeasure having the men and women trained to defend and protect the sovereignty of the country to dwell in congested and low-standard housing facilities. “To this end, I have instructed the Ministry of Defense to commence an immediate evaluation of all military barracks around the country and begin urgent repair and renovation of damaged housing units,” he disclosed. The Liberian leader said the men and women in uniform and their dependents will have better accommodations when the exercise is completed and the problem of congestion at military facilities will be finally eliminated. President Weah acknowledged that the successes the military is enjoying would not have been possible without the active and generous support of partners. “We are grateful for the immense contributions to our troops through scholarships and training opportunities, logistical, and other support that continue to enhance the administrative and operational capabilities of the AFL as a “Force for Good,” he noted. The C-I-C revealed that more than 500 personnel of AFL have been trained in various fields in many parts of the world including the United States, People’s Republic of China, the Federal Republic of Nigeria, Sierra Leone, Ghana, Bangladesh, the Arab Republic of Egypt, and Rwanda. He said AFL’s support to civil authority and local government remains critical in a post-UNMIL environment, pledging to do what is required within the scope of fiscal space in the implementation of these initiatives. The C-I-C also weighed in on the significance of the Liberian Coast Guard, which has the mandate of protecting Liberia's territorial waters. the President also pledged government’s support to the entire law enforcement agencies, including the National Police, the National Security Agency (NSA), the Drug Enforcement Agency (DEA) and the Liberian Immigration Services (LIS), to become more proficient and professional in the discharge of their functions. He disclosed that works on the 14 Military Hospital were in advanced stage and that it would be ready mid-2020. President Weah thanked the National Legislature for upholding your constitutional mandate in appropriating the necessary budgetary support for the Armed Forces of Liberia.